Click here to read the current assessment. Click here to go to the NIDIS website hosted by the Colorado Climate Center. Unsettled conditions in the north contrasted with intensifying drought elsewhere. The benefits of the February and early-March precipitation rapidly diminished across California and the Southwest as unseasonable warmth and dryness increased water demands and depleted snowpacks. In northern portions of the region, an influx of Pacific moisture generated rain and mountain snow from the Cascades into the northern Rockies. Precipitation totals were highly variable, with 2- to 5-inch totals (liquid equivalent) in the northern Cascades contrasting with amounts generally less than 1 inch over southern portions of the range. Most of the heavy precipitation fell outside of the region’s drought areas, with totals in southwestern Oregon averaging up to 2 inches below the weekly norm. Farther east, however, recent heavy snow eased Moderate Drought (D1) in southern Idaho and eliminated Abnormal Dryness (D0) in southeastern Wyoming and the northwestern tip of Nebraska. 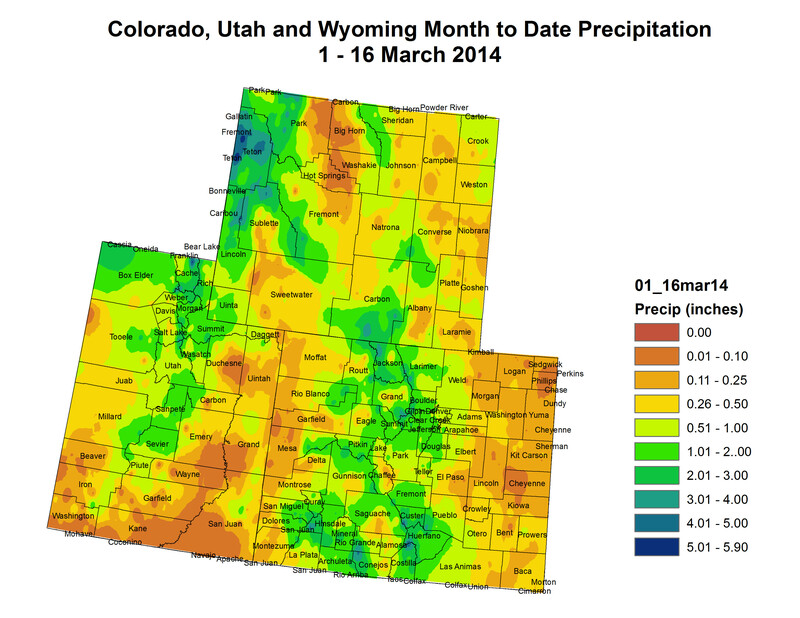 Farther south, a disappointing water year continued, with warm, dry weather quickly negating the benefits of the precipitation from February and early March across California and the Great Basin. Most notably, Extreme Drought (D3) returned to coastal areas north of San Francisco as well as the Sierra Nevada; over the past two weeks, precipitation deficits in these areas have averaged two inches or more. Water-year (Since October 1, 2013) precipitation has averaged less than half of normal over most of California, and locally less than 30 percent of normal in the state’s D4 (Exceptional Drought) area. Severe Drought (D2) expanded across southern Nevada, where water-year precipitation has averaged 40 to 60 percent of normal. Little — if any — drought relief is expected from the Pacific Coast to the Great Plains, with precipitation during the upcoming monitoring period mostly confined to the Northeast and Gulf Coast. An area of low pressure will produce snow in northern New England on Thursday, while warmer conditions briefly develop in the storm’s wake from the middle Mississippi Valley to the central and southern Atlantic Coast. Toward week’s end, another disturbance will produce some additional snow across the nation’s northern tier. Over the weekend, cold air will surge into the Midwest and Northeast, while rain will develop across the South. 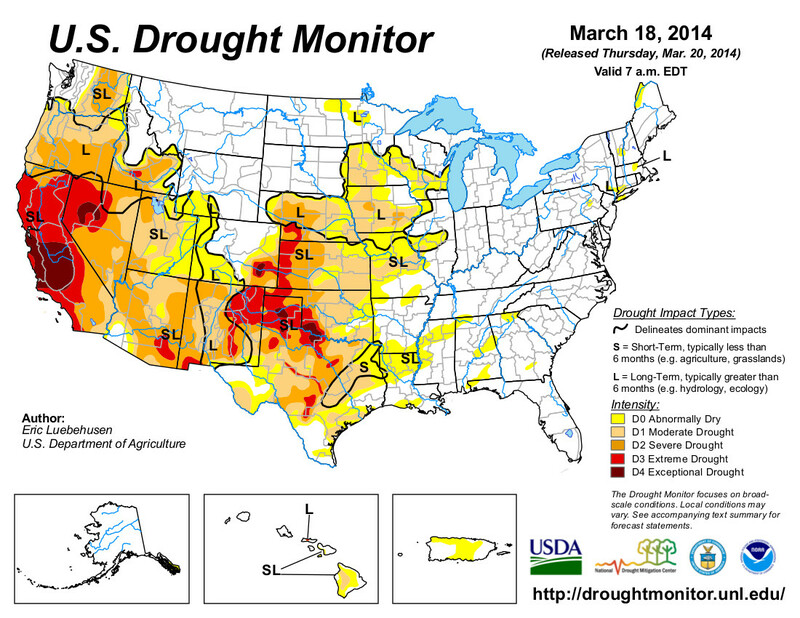 Dry weather will persist, however, from California to the southern High Plains. In addition, unusually warm weather will continue to plague California. The NWS 6- to 10-day outlook for March 25-29 calls for below-normal temperatures from the Plains to the East Coast, while warmer-than-normal weather will prevail in the West. Meanwhile, near- to above-normal precipitation across the majority of the U.S. will contrast with drier-than-normal conditions from southern California to the southern High Plains. Sponsors are working to increase funding for the Arkansas Valley Conduit in next year’s federal budget. 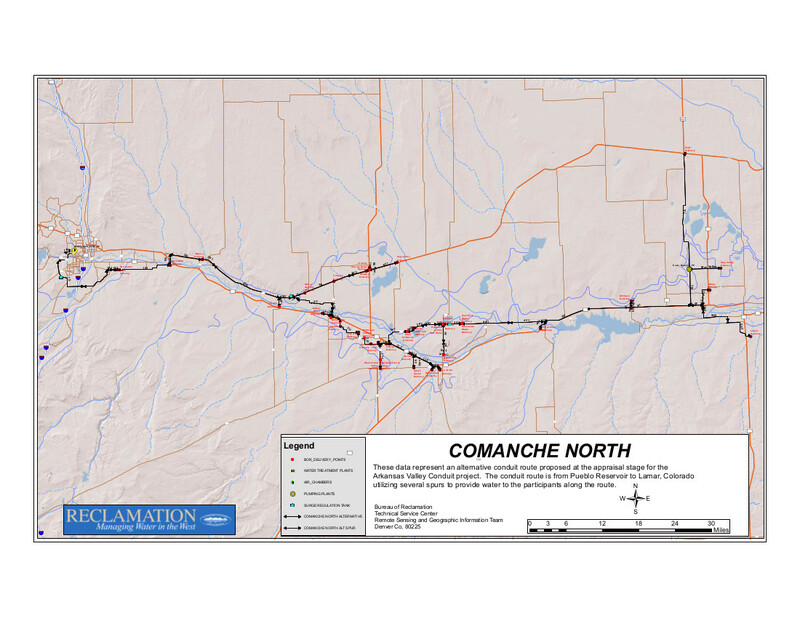 The conduit recently received the green light to proceed from the Bureau of Reclamation, which released a record of decision on Feb. 27 for it, a master storage contract and an interconnect on Pueblo Dam. But the approval did not translate into funding when President Barack Obama released his budget one week later and included only $500,000 for the conduit. “We were disappointed in the dollars,” said Jim Broderick, executive director of the Southeastern Colorado Water Conservancy District, sponsor of all three projects. He spoke at Thursday’s monthly board meeting. The conduit has $3.1 million in funding this year, which includes $2.1 million that was not spent in past years. To keep it on pace for construction sometime in the next decade would require at least $7 million to $10 million, Broderick said. Last year Reclamation internally shifted $44 million for projects, but it’s too soon to tell how much could be available this year. To do that, officials will again travel to Washington, D.C., to lobby Department of Interior and Bureau of Reclamation officials as well as Congress. Last week, Colorado Sens. Mark Udall and Michael Bennet, both Democrats, and Reps. Scott Tipton and Cory Gardner, Republicans, called for more funding to support the conduit. More Arkansas Valley Conduit coverage here. #COflood relief money headed to where it is needed? 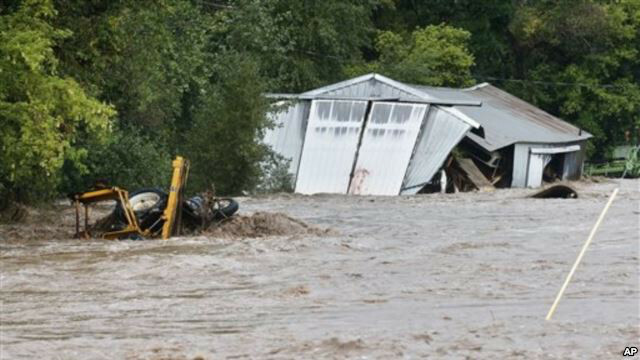 So far, FEMA has obligated $3.4 million of flood money to rebuild Longmont. So far, Longmont has seen $143,000. Why? Because when you try to do that much with a handful of state officials, it only goes so far. That’s changing. Not only has the division ramped up to six finance people and borrowed another three from its grant department, but last week, the state contracted with Deloitte — one of the “Big Four” accounting and audit firms — to provide another six. On Thursday, Longmont emergency manager Dan Eamon had his first meeting with a Deloitte representative. Eamon said he hoped that things were looking up from here. • Cities and counties submit estimates for work that they consider to be FEMA-eligible. This gets a quick sign-off from the state. • FEMA considers the request and decides how much to obligate. If an estimate is deemed to be eligible, FEMA can reimburse up to 75 percent of the project’s expense. • At that point, the city or county has to submit a different set of paperwork to the state on the actual costs as the work gets done. This is reimbursement money, not an up-front grant, so the state has to verify that the work was done, who did it, and several other details before the money can be released. So it’s FEMA’s dollars — but it’s the state who has to oversee and verify. And until recently, there just weren’t enough people to do that, Trost said.